When people ask me about Costa Rica, they often ask about the country’s best beaches, best ecolodges or most thrilling ziplines. For some strange reason they rarely ask about waterfalls. 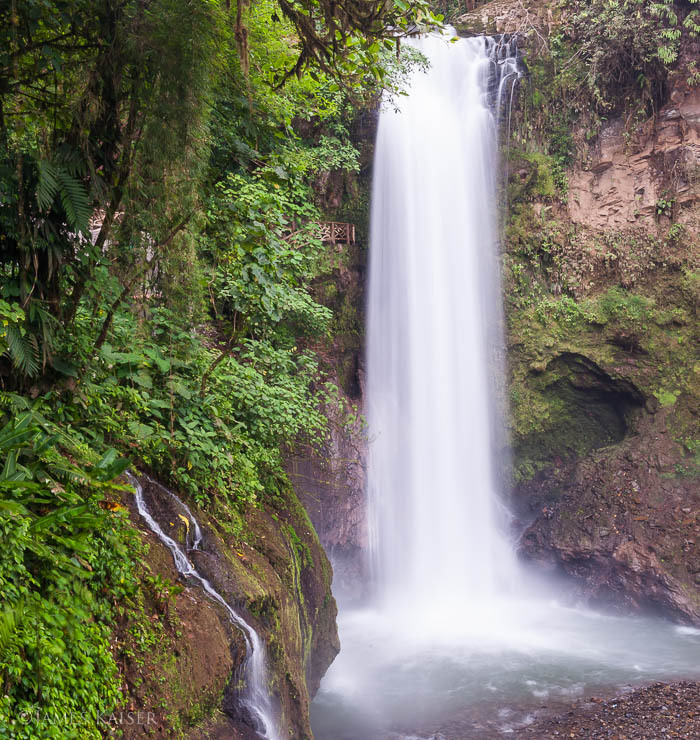 But after years of exploring Costa Rica while researching my guidebook, Costa Rica: The Complete Guide, I consider its stunning collection of waterfalls to be one of the country’s highlights. Costa Rica’s rugged mountains and abundant rainfall create a geography that’s literally overflowing with rivers. By some estimates only New Zealand has more rivers per square kilometer. 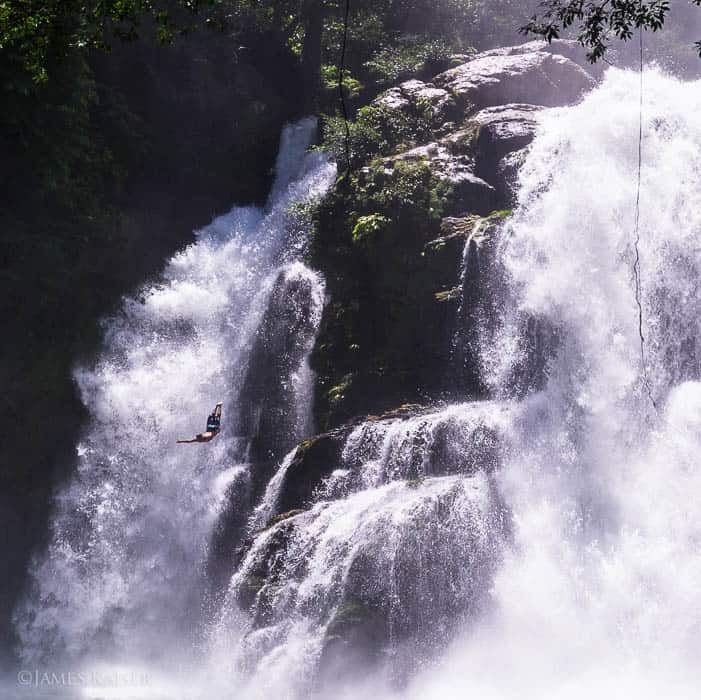 As water races down Costa Rica’s mountains on its way to the sea, it often leaps over sheer dropoffs, resulting in dozens of world-class waterfalls. No matter where you go in Costa Rica, there’s a waterfall nearby. But seek out the very best and you’ll be glad you did. Some are great for swimming, others are famous for jumping. Others are simply drop-dead gorgeous. Some waterfalls are located on private land, others in national parks, but all have the power to transform you. The combination of thundering water, cool spray and lush vegetation washes away the outside world, placing you squarely in the moment and inducing a deep state of pura vida. 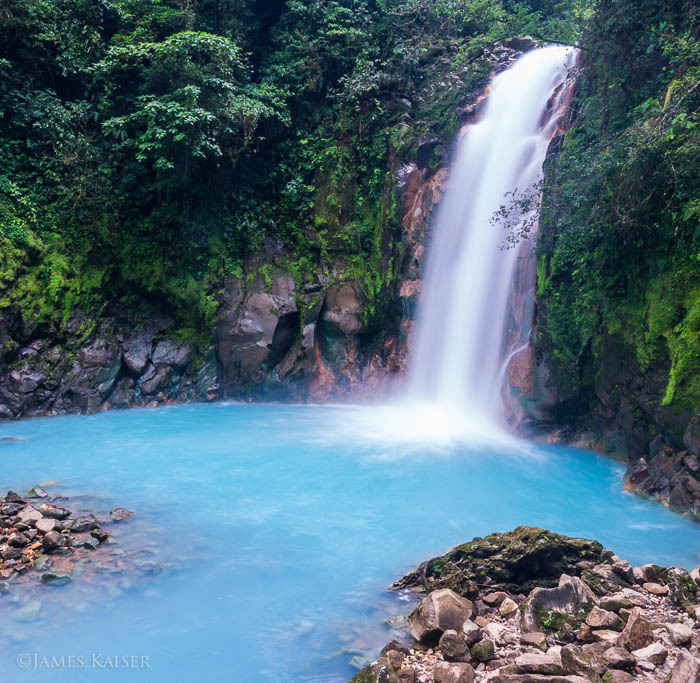 That’s not Photoshop—the Rio Celeste really is that blue. According to local legend, when God finished painting the sky he dipped his brush in the Río Celeste. Or maybe it’s all those aluminosilicates that naturally occur in the water. ¿Quién sabe, mae? Thanks to social media Río Celeste is no longer a secret, but its remote location in Tenorio National Park helps keep down the crowds. The waterfall is reached via a 1.5-km (1-mile) hiking trail, so plan on spending at least half a day in the park. Although tour companies run day trips from Arenal, I prefer spending the night at one of the wonderful ecolodges just outside the park. Note: The river often loses its brilliant blue color during the rainy season when the water turns muddy, so it’s best to visit during the driest months (January to March). Located a short drive from the Pacific beach town of Dominical, Nauyaca is one of the biggest waterfalls in Costa Rica. Divided into two stunning tiers, it tumbles down 65 meters (215 feet) into a large pool that’s good for swimming. Guided horseback tours of Nauyaca are offered by the local family that owns the surrounding property. Some guides thrill in swan diving off the tall ledges. Mere mortals should stick to the pool at the waterfall’s base. Llanos de Cortés is a broad curtain of water that tumbles into a large, shallow pool. Although big, it’s more delicate than powerful, with silky ribbons of water flowing over hanging plants. Located just 22 km (13.7 miles) east of Liberia, it makes a terrific day trip if you’re looking to escape the clutter of downtown. The turnoff, marked by a small wooden sign, is located about 4 km (2.5 miles) west of Bagaces on Highway 1 (The Inter-American Highway). From the turnoff, head 600 meters down the road, turn right at a small gate and drive five minutes to the large parking area. Admission, which benefits the local school, is $2 per person. 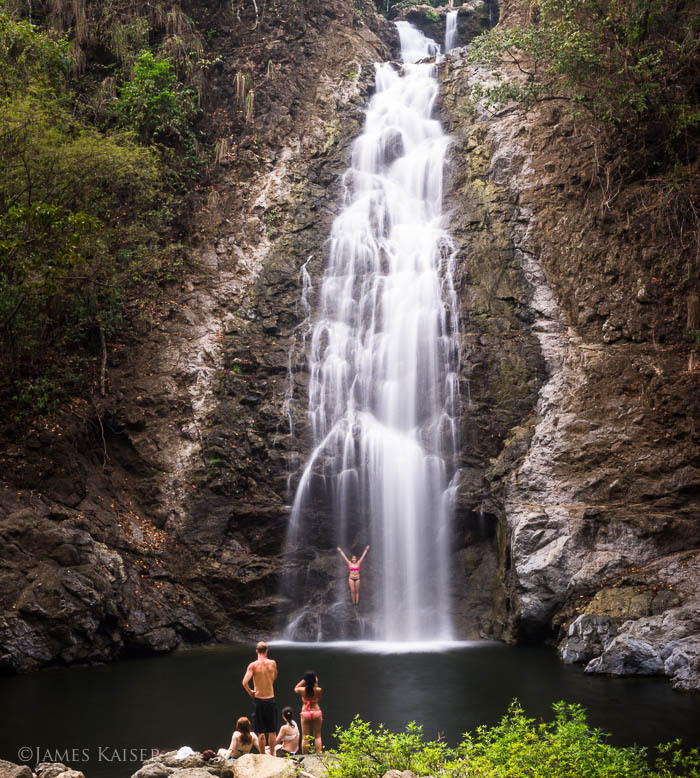 Most of Costa Rica’s famous waterfalls are tucked away in the mountains, but this three-tiered stunner is just a short stroll from the mellow beach town of Montezuma. The waterfall’s lowest tier is the most accessible. To get there walk west on the main road from downtown Montezuma, and after about 10 minutes you’ll cross a short bridge in front of La Cascada Restaurant/Hotel. Just past the bridge a rocky trail heads to the right to the base of the waterfall. If you’d like to reach the waterfall’s upper tiers, you have two options. The first, and most dangerous, is to follow the rugged path set back from the base of the waterfall. A better option is to head to Sun Trails, located up a steep hill just west of the parking area. Sun Trails charges a ₡2,000 entrance fee at the front desk to access their well-maintained trail system, which leads to the top of the waterfall. Although people do jump from the upper tiers, it’s definitely not for the faint of heart. This 70-meter (230-foot) waterfall, located just 5 km (3 miles) from downtown La Fortuna, is one of the most dramatic waterfalls in Costa Rica. 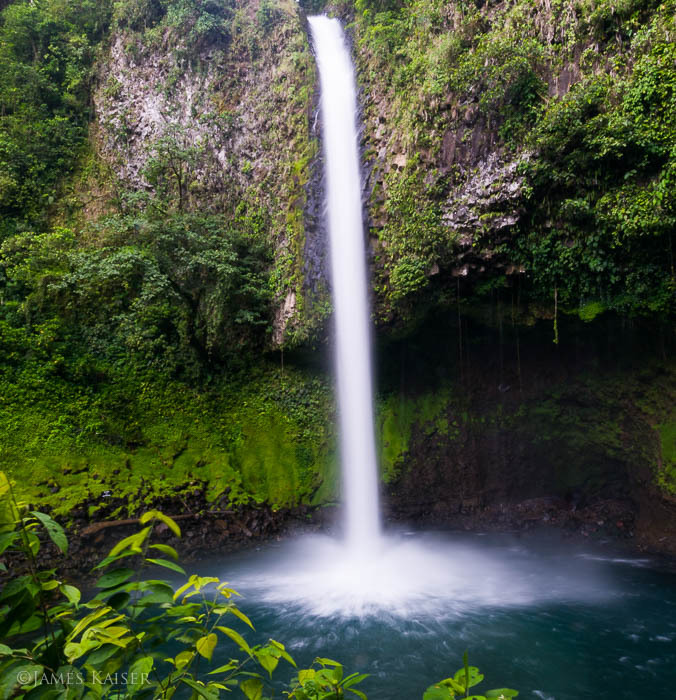 From the entrance ($10 per person, with all proceeds going to the town of La Fortuna), a steep trail descends nearly 600 meters (1,969 feet) to the base of the waterfall, a hike that takes 10–20 minutes depending on your fitness level. There are two observation platforms overlooking the waterfall, and swimmers can take a dip in the lovely, chilly pool. From the lower observation platform a short trail heads to a series of smaller, calmer pools located downstream. During peak season the waterfall can attract over 1,000 people per day; visit early or late to avoid the crowds. Open 8am–5pm. Note: A free swimming hole, popular with locals, is located just below the bridge crossing the Río Fortuna, just south of the turnoff to the waterfall on the main road. This privately owned property features five waterfalls, 3.5 km (2.2 miles) of hiking trails and a large wildlife refuge filled with over 100 Costa Rican species. A long descending trail heads from waterfall to waterfall, and guided tours are available. Located just 30 km (18.6 miles) north of Alajuela, La Paz Waterfall Gardens makes a wonderful day trip if you’re looking to get out of the urban jungle and visit the real one. It’s also great after a morning trip to Poás Volcano, which is located nearby. 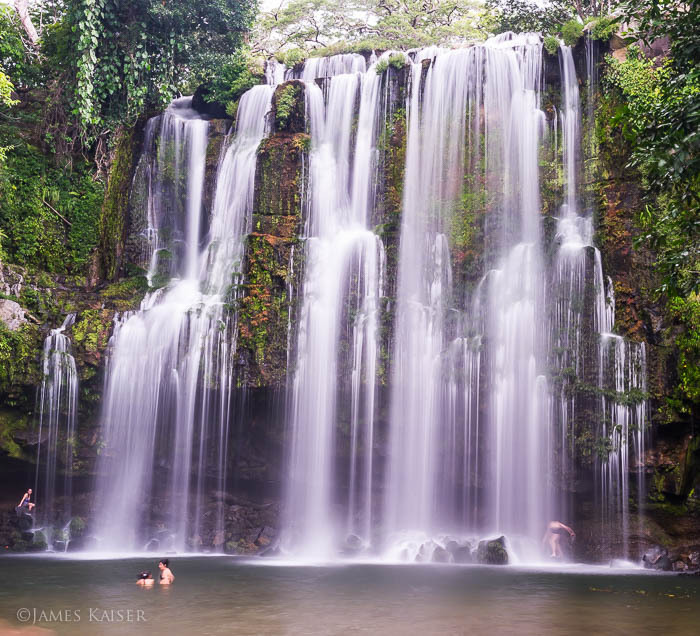 To learn more about Costa Rica’s best waterfalls, go to https://jameskaiser.com/costa-rica-guide/costa-ricas-best-waterfalls/.